Biologist Marm Kilpatrick studies the ecology of infectious diseases such as West Nile virus, which affects many bird species. With a wide-ranging research program on the ecology of infectious diseases, biologist A. Marm Kilpatrick studies the impacts of disease on animal populations, the spread of pathogens to new regions, and factors affecting disease transmission. An assistant professor of ecology and evolutionary biology at UC Santa Cruz, Kilpatrick investigates many diseases that raise public health concerns, such as West Nile virus, avian influenza, and Lyme disease. Much of Kilpatrick's work focuses on diseases affecting birds, and his contributions in this area have now been recognized by the American Ornithologists' Union (AOU), which has awarded him the Ned K. Johnson Young Investigator Award for 2008. 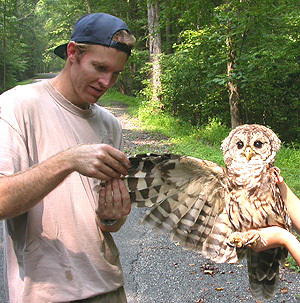 The award recognizes outstanding and promising work by a researcher early in his or her career in any field of ornithology. According to an AOU statement, Kilpatrick's work is "important, timely and at the cutting edge of the field.... [He] has become a leading figure investigating the ecology of disease in avian populations." His research on West Nile virus includes a recent study on the effects of higher temperatures on transmission of the virus by mosquitoes. He has also shown a connection between increases in human infections and dispersal of American robins, the preferred host of a mosquito species that is an important vector of West Nile virus. Kilpatrick's research on avian influenza ("bird flu") has led to predictions about the global spread of the virulent H5N1 strain of the virus. Based on a multifaceted analysis of data on viral genetics, migratory bird movements, and global trade in poultry and pet birds, his study suggested that H5N1 is most likely to enter the Western hemisphere via poultry imports, while entry into the United States is most likely to occur via natural bird migration from neighboring countries to the south rather than through Alaska. Kilpatrick is also investigating the bacterial disease brucellosis, analyzing the risk of transmission to cattle from bison and elk in Yellowstone National Park. Other projects include research on the effect of land use on Lyme disease risk; a fungal pathogen affecting frogs and other amphibians; and the effect of malaria on native Hawaiian birds. Formerly a senior research scientist at the Consortium for Conservation Medicine in New York, Kilpatrick joined the UCSC faculty earlier this year. He earned a B.S. in mechanical engineering and a B.A. in philosophy from UCLA, an M.S. in mechanical engineering from the Massachusetts Institute of Technology, and a Ph.D. in zoology from the University of Wisconsin, Madison. Note to reporters: You may contact Kilpatrick at marm@biology.ucsc.edu.